The products with the Linea Argenti trade-mark are the fruits of skilful designers, who create some exclusive, refined and stylish articles from design to performance. Many and complex are the phases of production which bring the item to the final realization. The main raw material of our items is a compound of polyester resin mixed with calcium carbonate. When the compound solidifies in a silicon rubber die, it is washed with acetone and faced by hand. The article is now silvered with an electrolytic process. The following phase is the oxidization, which gives to the objects particular gradations, creating light and shade areas. The item is now ready for a first brushing, necessary to take away the residual of the oxidization, and for a second and more accurate facing. Some particulars are satinated, some others polished by hand with special brushes, to create and wisely mix shiny and dull areas, which give to the item volume and refined play of lights. The piece of work is now immersed in an ultrasound basin to take away the residual of the previous processes and then controlled and selected. A solvent dryer takes away the humidity before the final phase: the articles are protected by special anti-oxidization paints which do not allow atmospheric agents to corrode the piece of work. 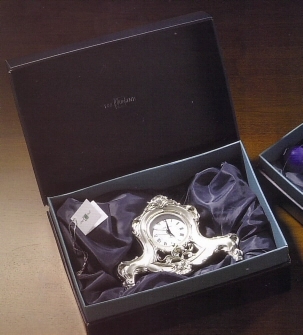 All of our items are equipped by a careful and refined wrapping with warranty certificates showing their manufacture.